A CBC investigation has revealed the Regional District of Central Kootenay paid over $800,000 for a tailings pond and surrounding land Salmo, B.C., that almost burst in July, nearly causing a toxic disaster. 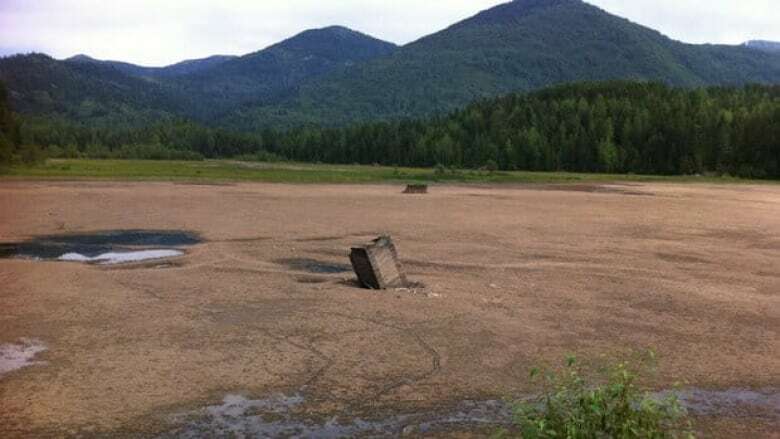 A CBC investigation has revealed the Regional District of Central Kootenay paid a highly inflated price for a tailings pond and surrounding land that almost burst in July, nearly causing a toxic disaster near Salmo, B.C. On July 3, the dam on a decommissioned tailings pond containing heavy metals began to give way. Now the Regional District of Central Kootenay is responsible for repairs, totaling upwards of $500,000. Heavy rain pushed water levels on the small lake much higher than normal, and a sinkhole inside contributed to the partial collapse of its earthen dam. The tailings pond is owned by the Regional District of Central Kootenay, and is adjacent to the district's landfill. In in-camera meetings in the late 1990s, engineers urged the district to purchase the land surrounding its landfill, including the Hudsons Bay mine tailings pond, once owned by Cominco. Documents obtained by CBC show in the summer of 1997, before the regional district was able to buy the land, a company was formed in Panama called Seattle Corporation. Seattle Corporation then purchased all the land surrounding the regional district's landfill, including the mine tailings pond. The record of sale shows Seattle Corporation paid $149,000 for the land. Six months later, the company sold it to the regional district for more than five times that amount — $800,000. "Seattle Corporation got a $600,000 profit from that sale," says Michael Jessen, who was doing contract work for the regional district at the time. "Somebody has made a tremendous amount of money in a short period of time and that should raise some red flags." Local resident Ralph Moore says he and others were suspicious of the deal from the start. "It seems to me there was someone with inside information that there was going to be a need for land for a large property for a landfill and somebody started planning this quite a while ahead of time. Forming a shell company and the shell company then purchased the property," he says. Moore, Jessen and others went to the RCMP with their concerns but were told officers were too busy to pursue the matter and it was dropped. Jessen says he was so disgusted by the land deal he quit working for the regional district. Local government officials who worked with the regional district at the time of the purchase say they got the best deal they could under tough circumstances, and that whoever set up Seattle Corporation in Panama was doing it to avoid Canadian taxes. The regional district's then-administrator said he could not remember Seattle Corporation or what the district paid for the land. Now, more than 10 years later, the land and tailings pond have become a liability for the Regional District of Central Kootenay. Draining the tailings pond and reinforcing the dam has cost the regional district around $500,000 and the bills are still coming in. "This land fill site has been a thorn in the regional district's side since day one," says Jessen. "I don’t think the public has ever had a full accounting of what that landfill site has cost us. The public needs to know how much of their money has been poured into this sink hole. It’s supposed to take garbage but it’s been swallowing money."